I’ve had a crisis with my blog over the past few days, half off my photos have disappeared so I am working to get them all back up and running, so don’t worry it’s not you! It’s me. This happened 3 days ago I think, also around the time that my Marketing Apprenticeship tutor came for my 6 week review. Great timing. Alas, for this unit WordPress isn’t good enough as an example. And I now have to learn basic HTML code and build a mock website from scratch. Let’s just say I’m not jumping for joy. Code is a foreign language, and I am rubbish at languages. So for me to complete my apprenticeship by the end of October with this and 5 other projects, plus running and fixing my blog, plus work…… well, it’s pretty darn stressful! That’s enough of the bad stuff for one day, in other news I am going on holiday in 2 weeks! Sam found a cute little place in the lake district which we are going to stay in for a week in the last week of August. I cannot wait! I was convinced we weren’t going anywhere this year. Because between my apprenticeship wage, saving for a house and for driving lessons… I didn’t have much hope. But we are going, and I cannot wait to share it with you guys! So, for the reason we are here. 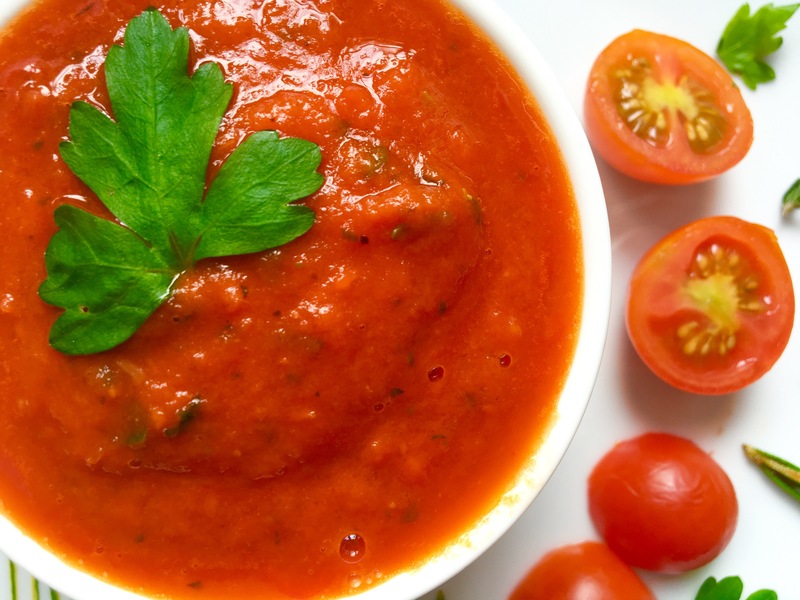 Tomato sauce is an essential recipe to know, and I use it in so many of our favourite dishes. This sauce is a perfect base for pizza, lasagna, pasta bakes and Ziti… the list goes on! So, of course I wanted to share this with you today! It’s so quick and easy to make, and is packed with fresh herbs. If you’re feeling adventurous you could even add a chilli into the mix. Such a versatile sauce and so simple to create, it really is an all round winner. 1.First of all, if you are lucky enough to have fresh herbs growing in your garden (which i do thanks to my mum), go out and pick them straight from the plant. If you ever have the choice between fresh and dried, choose fresh because the flavour and aroma is just so much better.If not, either buy fresh herbs or dried for this. I couldn’t find oregano so I had to use dried. 2. Chop up your onion and garlic, while trying your best not to cry. I heard that freezing your onion before chopping it can help to stop the sulphurous gases escaping when you chop it. Have any of you tried this? 3. Begin to sweat down your Onion and Garlic on a low heat in a pan with olive oil. Once the onion begins to go translucent (after around 4-6 minutes) add in the pepperoni, chorizo or bacon. Cook for 2 more minutes. Season with salt and pepper. 4. Add in your tomatoes, halved. Cook on Medium heat for a few minutes until the tomato skin begins to shrink. Add the chopped tomatoes and bring the boil. 5. Turn the heat down to a simmer and add in the herbs and tomato puree. Simmer for 6-8 minutes with the lid on. Add 1 teaspoon of sugar to help really bring out that tomato flavour. 6. Using a hand blender (if you don’t have one, wait for the sauce to cool and pour into a jug blender) blend the sauce until smooth. You can add a little water in at this point if you want the sauce a little thinner. 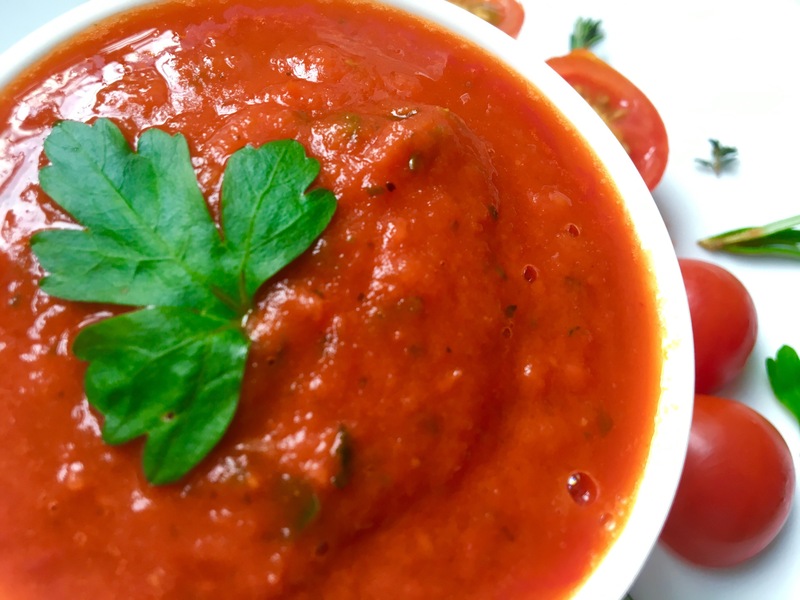 I hope you liked this recipe, let me know how you make your tomato sauce in the comments. Do you have any special recipes? That vacation will be so nice! Oh my gosh, that fresh tomato sauce sounds so good. I’d love to make some. I love making my own tomato sauce. There is nothing better than making a sauce fresh as it makes everything taste better! Exactly, fresh herbs make all the difference! Homemade tomato sauce is the best! I’m not the one who makes it though so I can’t tell you exactly what’s in it lol. Your recipe looks delicious! This post was so fascinating, I loved seeing every step of the process. 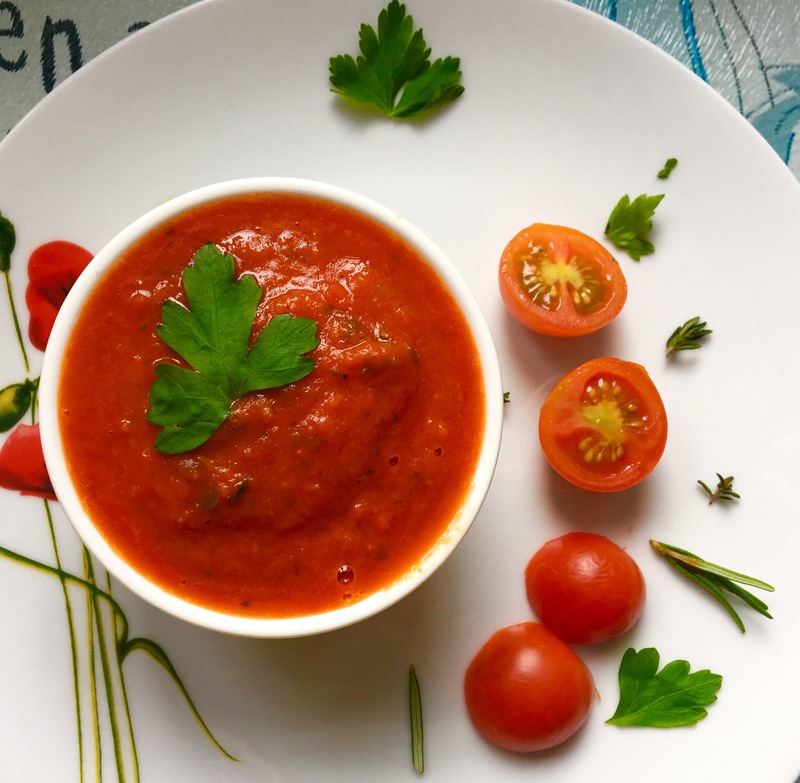 I love tomato sauce especially homemade and I can just taste it now! Thank you! It’s our number 1 recipe in our house! I made a tomato sauce yesterday from scratch and I hope to try your recipe next time. It looks and sounds amazing. I hope you have a wonderful vacation. Thank you! You’ll have to let me know how it goes! Hi, I’m Imogen. A 22 Year Old Blogger from Manchester, UK- A redhead with a head full of ideas and a love of writing. I really hope you enjoy exploring my site and please feel free to leave me a comment or 2 along the way! Watercolour Painting: Where Do I Start?